Imagine a group of rubber bands holding a rolled-up newspaper or a bundle of sticks together. As long as the rubber bands are wrapped tightly enough, whatever they are holding stays in place. However, if you grab those bands and pull them out until the rubber stretches, they aren’t able to hold that newspaper or those sticks as tightly as before. Suddenly the bundle is loose and unstable. The ligaments in your joints function in a similar way. They hold your bones together while stretching just enough to allow movement. When they become overstretched, like in a sprain, your joint loses its stability. An ankle sprain occurs when the foot twists or rotates suddenly at an awkward angle. The connective tissues that hold the joint together stretch beyond what they are meant to handle and, in severe cases, may even tear. It’s a common problem for athletes, who put a lot of stress on the ankles with their sudden starts, stops, twists, turns, and jumps, though anyone can step wrong and injure the ligaments. Generally you feel a sharp, sudden pain and weakness. You may even have trouble bearing weight or moving the ankle much. Usually the area swells up and it may or may not bruise. 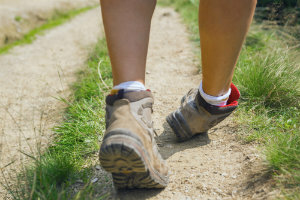 Sprains actually have three degrees: mild sprains involve some stretching of the connective tissues and low swelling. Medium sprains have some partially torn tissues, more swelling, and may feel very loose when you try to move the ankle. Severe sprains include a ligament rupture, serious swelling, and significant weakness in the joint. No matter the degree of damage, the injury needs to be treated right away. Without rest and care, the tissues continue to be strained and may heal incorrectly, leaving you chronically weakened and vulnerable to additional damage. To tighten up those loose connectors and reduce the pain in your ankle, you need intentional rest and intervention. You should also have the affected area checked for any fractures or tears that may require more intense remedies. Our specialist Dr. Noah Levine will examine the injured ankle and may request diagnostic images to see the extent of the damage done to your tissues. Once we understand how severe your sprain is, and have ruled out a fracture or other condition, we are able use treatments tailored to your needs to repair the damage. You will need to rest the ankle while you heal. For a mild condition, this may simply mean a break from your sports or other athletic activities. For more serious injuries, you may need to remove all weight from the affected joint. Ice and anti-inflammatory medications help reduce swelling, relieving some of the pain. Using a wrap or a brace to both compress and stabilize the joint also helps. You should keep your foot elevated while you rest it to continue to discourage swelling. Once the doctors have determined your joint is sufficiently healed, you can slowly return to your activities. You may need some physical therapy to build up your strength and stability again, as well as to prevent re-injury. In rare cases, the sprain may need surgery to repair the torn tissues and prevent chronic weakness. As common as ankle sprains are, they’d shouldn’t be taken too lightly. They can cause serious damage to the lower limb structures you need to keep your joint strong and supportive. If you think you may have sprained your ankle, but haven’t had it evaluated and treated, don’t wait for it to sprain again—or become permanently weaker—before seeking help. Instead, contact Absolute Foot Care Specialists in Las Vegas for an appointment or more information. Visit the website contact page or call (702) 839-2010 to reach any of our offices.